The Key set is one of the two new accessory sets for the Velik’s Fate. The other is the Godly accessory set. The Key set is intended to be a PVP set and only has one tier for each piece. The stats for the Key set are equivalent to the Heavenly set but has an additional PVP fixed line. The Key jewelry pieces are not unique, which allows for duplicates of each to be equipped. There are two variations of Key Accessories: Crit Factor and Power. There is no Healing or Aggro variation for this set. Key accessories are crafted using Heavenly pieces and materials obtained from the battleground boxes. The recipes for the Key accessories are obtained from Corsairs’ Stronghold, Gridiron, Fraywind Canyon, and Champions’ Skyring Victory Chests. These chests can drop Key Accessory Design Boxes, giving the player a random design. Both the Crit Factor and Power variations have 3 recipes (Necklace, Earring, and Ring), for a total of 6 different possible recipes. 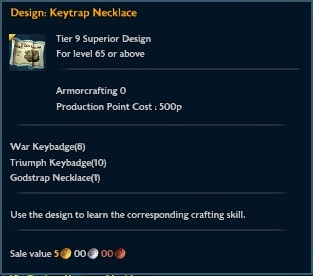 Use this design to learn the corresponding crafting skill. These are the possible stats you can roll on your jewelry piece. These are the values of the stats you can roll on your jewelry piece. You cannot double roll for the same stat with the same value. For example, you can roll 4 Power and 2 Power on a ring, but you cannot roll 4 Power and 4 Power on a ring. <With 2 of set:> Increases Crit Factor by 12. <With 3 of set:> Increases Attack Speed by 4%. <With 4 of set:> Increases Endurance by 4. <With 5 of set:> Increases Crit Factor by 6. <With 2 of set:> Increases Power by 8. <With 5 of set:> Increases Power by 4.